Get the gorgeous and efficient countertop you’ve always wanted by contacting Houston Custom Carpets Flooring & Remodeling today and we would love to provide you with a free quote. At Houston Custom Carpets, we offer a wide array of home remodeling services including high-end countertop installation. 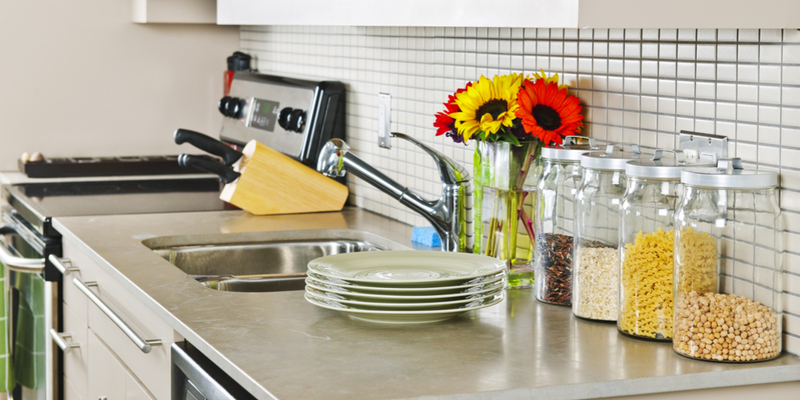 We understand that selecting a new countertop is a big decision. We are here to help you every step of the way. Come to our showroom where you will find a varied selection of designs and materials. Natural stone and quartz countertops are well known to increase a home’s value, and are one of the most attractive features to home buyers. A kitchen simply looks more luxe with a high-end countertops as a focal point. Whether you choose granite, quartz, or a beautiful soapstone, your kitchen will have never looked better. 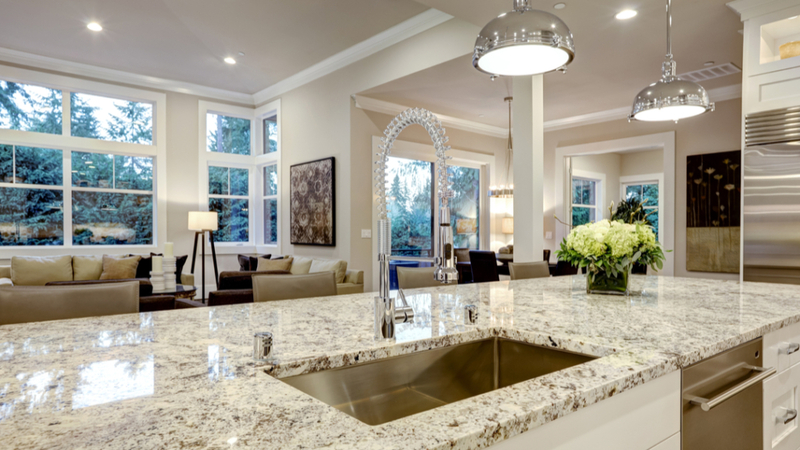 Nothing says permanence and quality quite like a granite countertop installation. This natural mined stone is incredibly durable and will last for as long as you want it to. 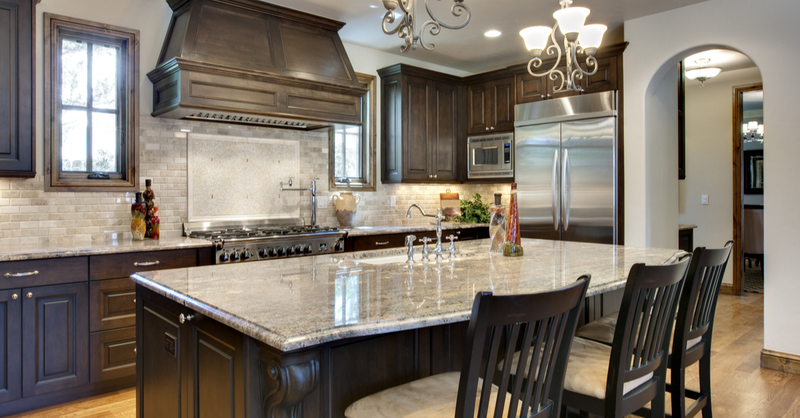 Granite countertops offer excellent resilience to every day life. Sealing a natural stone, such as granite, ensures an easier cleanup by creating a barrier that resists bacteria & dirt. The textured natural beauty of the patterns found in granite are a sight to behold, and every countertop is unique in its own way. 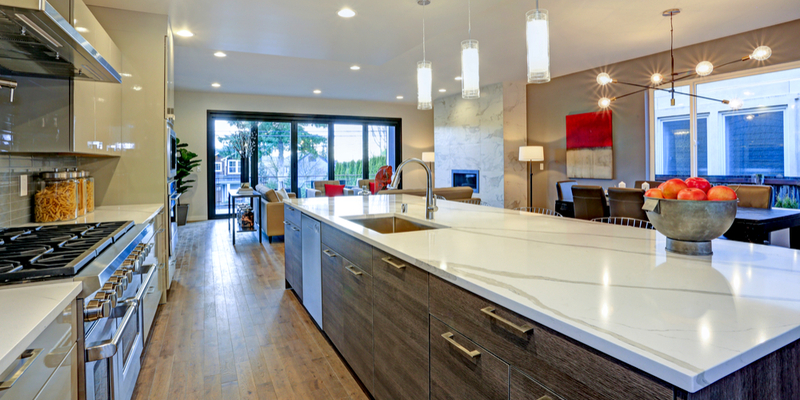 Though it might be hard to believe from looking at them, quartz countertops are not a natural stone, but are engineered from ground-up quartz mineral set in resin. They are exceptionally hard and durable, and completely non-porous. This makes them impervious to stains and bacteria, so clean up is simple. If you want a countertop installation with a material that is very low maintenance that won’t scratch easily, give quartz a try. Soapstone is available in a range of grays, greens, and blacks with swirl and vein patterns that resemble marble. Being non-porous and inert, it is exceptionally stain resistant and doesn’t need to be sealed. It is heat resistant and can be cleaned easily with soap and water, making it a low maintenance choice for your Houston home. It is softer than other stones, meaning it can get scratched, though these can be sanded out. Soapstone can lend a wonderful old-world feeling to your home, and it goes beautifully with clean white cabinets. Whichever type of countertop installation you choose, you can be certain you will have a quality product that adds value and elegance to your home. Our expert countertop team will handle everything from the measurements to fabrication and countertop installation. To learn how you can make your kitchen sparkle with a new granite, quartz, or soapstone countertop, contact Houston Custom Carpets today.